Why? 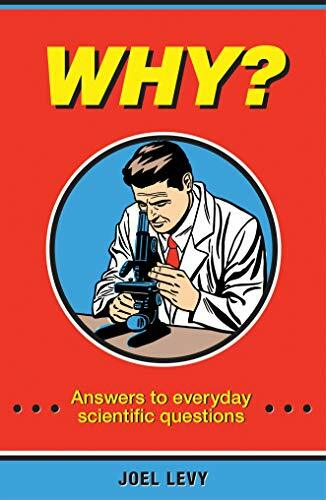 Answers to Everyday Scientific Questions gets to grips with concepts that appear simple and straightforward, but which most people, when asked, really can’t explain. Why is the sky blue? Why is water wet? Why do we need sleep? Why are there 24 hours in a day? For each question, author Joel Levy provides a simple, single line answer followed by more in-depth information about the scientific background on these essential topics. The book spans physics, biology, chemistry, geology, geography, meteorology, paleontology and planetary science - allowing readers to wow friends and family alike with pithy answers to the obvious questions they never thought to ask. JOEL LEVY is a writer and journalist specialising in history and science. He is the author of more than a dozen books, including Newton's Notebook, Great Scientists, Mad Science (revealing the secret histories of madness, magic, and mysticism among great inventors and scientists), The Doomsday Book (a guide to scenarios for the end of civilisation), History's Lost Treasures, and the forthcoming History's Worst Battles. He has also written features and articles for the national press, and has appeared on national television and numerous local and national radio shows. A long-term student of the history of science and medicine, Joel has a BSc in Biological Sciences and an MA in Psychology.